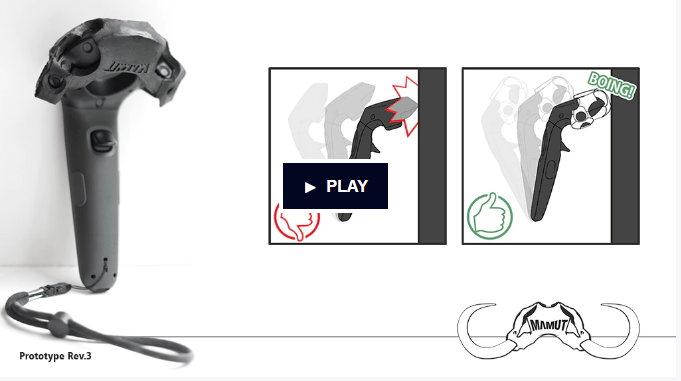 Last chance to preorder the Mamut protectors for HTC Vive controllers! If you haven’t preordered the Mamut Skull protector for the HTC Vive controllers, now’s your last chance with less than 24 hours left for preordering. There are a lot of reports from HTC Vive users who damaged their motion controllers. Although the Vive has a chaperone system — a virtual fence that warns the user if they are near the boundaries of their play area, or are near objects, people can still get carried away and accidentally hit the wall, the ceiling, furniture, or bystanders with their motion controllers. At $129 each, you wouldn’t want to have to buy another controller. Worse, they are currently out of stock. The Mamut Skull is a protective armor for your controllers, to mitigate any damage to people, objects, or the controller itself. In my view, they are a must-have for anyone with an HTC Vive. The Mamut Skull has a unique design that prevents the sensors from being occluded. The Vive needs to see at least 3 sensors to be able to track the controller. Here is an occlusion test. The Mamut Skull is around $27 (kr230). You can also get the complete kit with a sturdier strap and a microfiber cloth for $38. Delivery is in December. Although the preorder is via Kickstarter, it’s actually already fully funded because the creators found alternative funding for the most critical piece of the project — the injection mold — thus allowing them to proceed to production and accept preorders. Here is the link to the preorder page.